World Hunger Day 2013 goes unplugged for the first time in a series of up close and personal live music sessions dedicated to Jazz, Soul, RnB and Gospel music in the heart of London’s Soho. After The Hunger Project UK’s successes of two sell-out concerts at the Apollo Victoria and the Royal Albert Hall in 2011 and 2012 respectively, this year’s World Hunger Day events move to an equally iconic venue - PizzaExpress Jazz Club in Soho, which was redesigned in April and now features artwork celebrating its jazz roots. Since 1969, PizzaExpress Jazz Club has welcomed on its stage some of the world’s greatest musicians including Ella Fitzgerald and Amy Winehouse. “I have been overwhelmed by the charity’s ‘make-it-happen’ attitude to ending Hunger and the unique way in which they offer practical partnerships. The Hunger Project UK seeks to inspire those suffering from Chronic Persistent Hunger to take action and believe in their own ability to create sustainable futures for themselves and the communities in which they live. As Dionne says herself, 'If you can think it, you can do it!' added Joe. "With Jazz in the very heart and soul of my musical craft, I can’t think of a better time and place to showcase the journey of my 25 year career and what better cause than to step up myself for the end of Hunger and Poverty. I am sure all my fellow artists for this special concert season are as happy as I am to donate our collective talents in order that others have the opportunity to build a brighter future for themselves. This effort is all about partnership and success can be achieved and in our lifetime. As I’ve sung so many times, ‘Get ready…get ready for the dawning…'"
“We are all so proud to have been part of The Hunger Project UK’s journey from 2011 to date – and what a journey it has been. Our passion for the Music and the Cause are second-to-none. We encourage all our supporters and partner Faith Groups to foster permanent change for those suffering with Chronic Persistent Hunger. Get the nation-a-singing to the beat of ‘One World One Song.'" 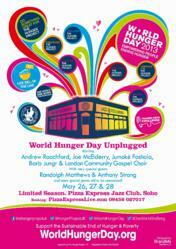 On 26th May 2013, the World Hunger Day Unplugged season, in aid of The Hunger Project, kicks off with a roof raising, spirit lifting Gospel Brunch in the company of the spectacular voices of the London Community Gospel Choir - celebrating 30 years as the pre-eminent figures of UK Gospel Music. Expect to be inspired by their funky gospel flair, swing-beat, RnB, traditional and soulful arrangements, with invigorating choreography and vocal gymnastics. Formidably versatile vocalist and long-time World Hunger Day supporter Jumoké Fashola is joined by an ALL-STAR line-up for this stunning Jazz Celebration in aid if The Hunger Project. Guests include legendary vocalists Barb Jungr and Mari Wilson, sensational singer/pianists Anthony Strong, the amazing Canadian jazz singer/songwriter Tammy Weis, Simon Wallace and the incredible tones of Randolph Matthews. With a career spanning over two decades, a string of hit singles, platinum and gold albums and song writing and touring collaborations with, among others, ‘Mike and The Mechanics’, singer-songwriter Andrew Roachford is undeniably a prolific and unique talent. His rare ability to put into words ‘feelings you didn’t even know you had’, has become his trademark. Growing up in a ‘vibrant melting pot’ culture in London, his influences are as diverse as his family’s own jazz roots: the soul of Stevie Wonder, Al Green and Jimi Hendrix … through to reggae, punk and rock. But when all has been said and done, whatever the flavour of his music, Andrew is at his absolute best ‘taking the daily challenges of life and love and helping the rest of us make sense of it.’ This is Andrew and Omar’s début at PizzaExpress Jazz Club and as artist ‘Friends’ of World Hunger Day. In only a very few years, Joe McElderry has become one of Britain’s most popular young vocalists, demonstrating his professional commitment and determination, and the depth and breadth of his talent, by winning both ‘X-Factor’ and ‘From Popstar to Operastar’. His support for The Hunger Project started last year when he joined our cast at the Royal Albert Hall, raising its roof in his own right, as well as duetting with Dionne Warwick in the world première of ‘One World One Song’. Dionne and Joe have recently completed the recording of this song for its single release on May 27th, World Hunger Day 2013. This event mark’s Joe’s PizzaExpress Jazz Club début – ‘up close and personal’ more than ever before. Expect a very different Joe McElderry show, seamlessly blending diverse musical styles. From five times Grammy Award-winning, Dionne Warwick: “I can’t believe it’s three years since I launched World Hunger Day with Tim Holder and The Hunger Project UK – and what an incredible journey it’s been, with over 10,000 people having already attended the live music and dance events we prepared. Although I can’t be there in person this year, I have made my contribution to World Hunger Day 2013 by joining Joe McElderry in recording ‘One World One Song’, a brand new anthem written by my co-creator of World Hunger Day, Tim Holder, legendary songwriter Tony Hatch and THP UK Patron, Rod Natkiel". The single ‘One World One Song’, featuring Dionne Warwick, Joe McElderry & Friends, is available for global pre-order from the 17th May 2013, as a digital track. An instrumental/karaoke version will also be available to buy/download, ‘You Sing’, as well as the single itself for both communities and individuals alike. The Hunger Project UK is encouraging everyone to sing and share the meaning of ‘One World One Song’. Over the coming days all social media channels will be live in relation to the single so that you can share and celebrate ‘One World One Song’ via youtube, Twitter, Facebook etc. For more information about ‘One World One Song’, World Hunger Day Unplugged and the launch of the charity single please visit http://www.worldhungerday.org. Text LOVE 28 £3/£5 or £10 to 70070 to create opportunities for everyone to end their own hunger and poverty. The Hunger Project registered charity number 326688. -Artists and lineup are subject to the change at the discretion of the organisers. For photos/interviews please contact Miranda Leslau miranda(at)mirandaleslau(dot)com or on 07912 644993.